Model BRL-250, S# 389, 20" Swing (28" in 13"L x 5" removable gap), 10' Between centers, 2.5" Thru hole, 10.5" 3 Jaw chuck, 16 Spindle speeds from 34 to 1,270 rpm, Threading inch/mm/pitch fpm, Taper attachment, Thread dial on carriage, Engage levers on carriage & headstock, 2 Slide out chip/coolant catch pans, Drive motor 7.5hp, Overall Dim. 15' 4"L x 3' 10"W x 4' 10"H, Est. Wt. 5,600 lbs. Hoston Removable Gap Bed 31" - 39" x 120" - "New"
Model C6280Y, 31.5" Swing over bed, 39" Swing in 11"L gap, 120" Between centers, 4" Thru hole, Max travel of compound rest 4.33", Max travel of cross slide 12.79", In/mm Threading, Longitudinal lead screw pitch 2TPI, 72 Longitudinal feed ranges from 0.073 to 4.066 mm/rev, 72 Cross feed ranges from .036 to 2.033 mm/rev, 72 Metric thread ranges from 0.5 to 112mm, 72 Inch thread ranges from 56 to 1/4", 36 Module thread ranges from 0.5 to 7mm, 36 Diametric thread ranges from 56 to 4DP, Dia. of tailstock sleeve 3.54", Morse taper No. 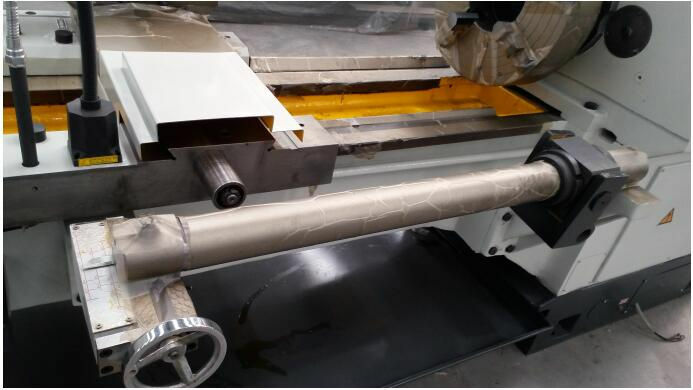 6 on tailstock, Travel of tailstock sleeve 5.9", Cross adjustment range 0.393", 11kw 220/380/440v 3ph 60hz, Standard accessories: 3 Jaw chuck, Driving plate, Center & center sleeve, Wrenches, Oil gun, Operation manual, Optional accessories: Longitudinal automatic trip, Live center, Quick change tool post, Taper copy ruler, 4 Position longitudinal automatic trip, Overall shipping Dim. 15' 10"L x 4' 4"W x 7'H, Est. Wt. 10,360 lbs. 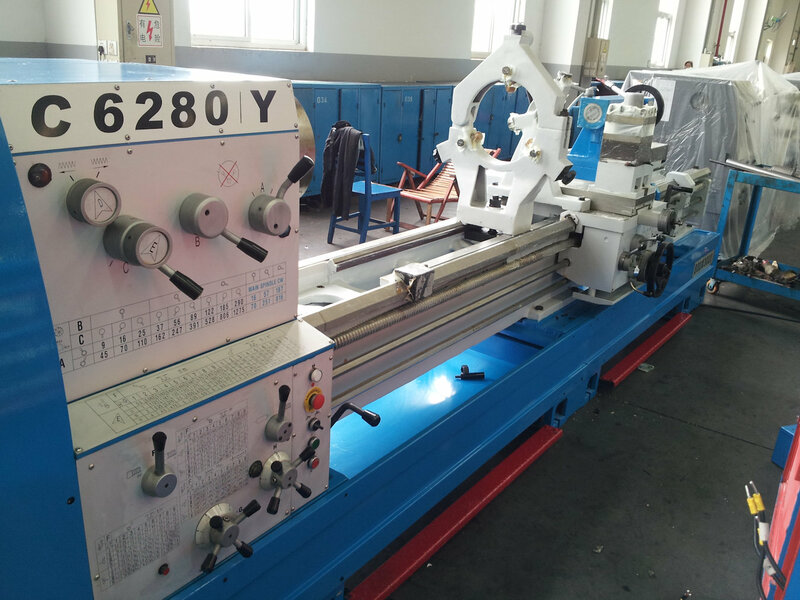 Kent KLS-2280C Gap Bed Lathe 22" - 30" x 80"
LeBlond Regal Gap Bed 19" - 30" x 44"
Model Regal, S# E6237, 19" Swing (30" in removable gap), 13"W x 12"L x 5.75"H Gap, 44" Between centers, 1.5" Thru hole, 8 Spindle speeds from 20 to 425 rpm, 8" 3 Jaw Cushman chuck, 15" 4 Jaw chuck, 56 Threading ranges from 1.5" to 184, Coarse/Fine threading, Thread dial on carriage, Roller bearing steady rest with 6" thru hole (missing clamp base), Full length chip catch pan, Flip down safety shield over chuck, Oil cup lube system, 3hp 220/440v 3ph, Overall Dim. 8' 4"L x 5'W x 4' 9"H, Est. Wt. 5,000 lbs. Standard Modern Sliding Gap Bed 19" - 36" x 54"
Model 19/36x54, Cat. No. 52296, S# 11454, Date Mfg. 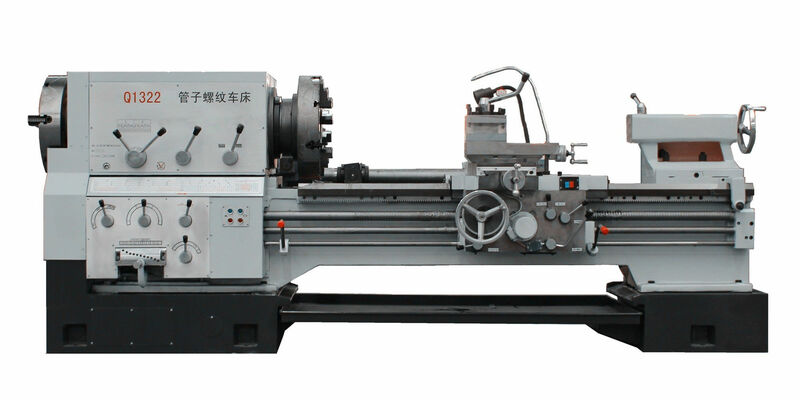 02/1992, 19" Swing (36" swing in gap), 44" Between centers closed (54" centers open), 18 Spindle speeds from 17 to 1,000 rpm, 2.25" Thru hole, Inch/mm threading, Inch/mm dials, Taper attachment, Engage lever on carriage, 7" Travel on tailstock, Pull out chip catch pan, Oil cup & grease fitting lube system, 7.5hp 230/460v 3ph, Cleaned & painted, Overall Dim. 8' 4"L x 4'W x 5' 3"H, Est. Wt. 4,500 lbs. 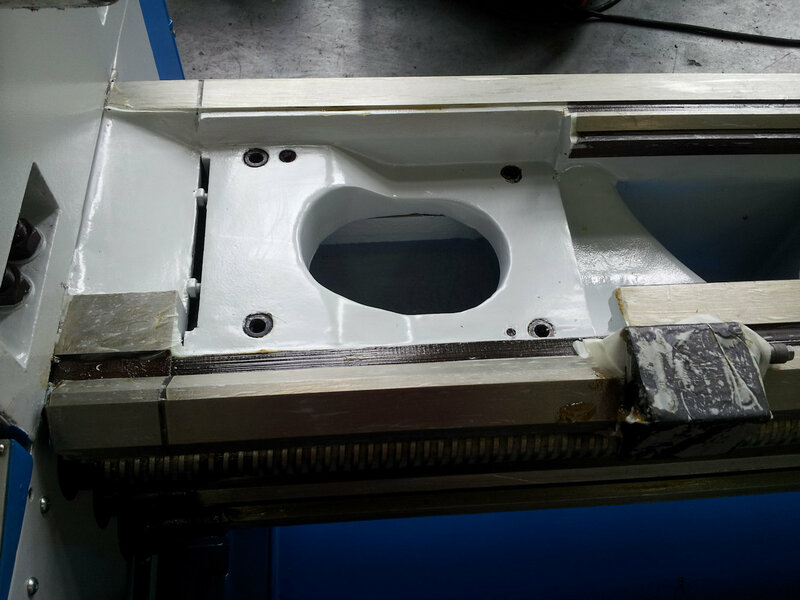 Standard Modern Sliding Gap Bed 20" - 36" x 54"
We are an authorized dealer for Hoston machine tools, Click on the Icon to the left or the links below to view their Lathes. Contact us for options and current pricing. 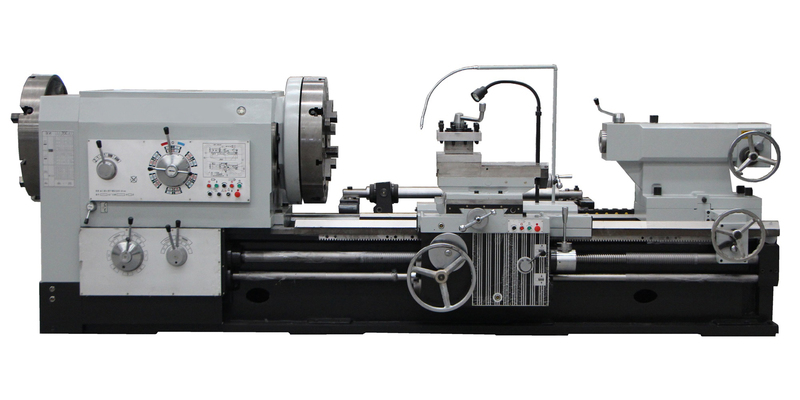 We are an authorized dealer for Baileigh Industrial, Click on the Icon to the left or the link below to view their Lathes. Contact us for options and current pricing. American Pacemaker 16" x 102"
Atlas/Clausing 5300 13" x 24"
Model 5300, S# 001000, 13" Swing, 24" Between centers, 1.5" Thru hole, 2 Way V belt step pulley spindle, 48 Threading ranges from 4 to 224, Fwd/Stop/Rev control, Flame hardened bed ways, Full length chip catch pan, Drawers & storage cabinet in base, 1hp 220v 3ph, Overall Dim. 4' 9"L x 32"W x 4' 6"H, Est. Wt. 1,000 lbs. Model Storm 220, S# T40066, Date Mfg. 2003, 20.07" Swing, 8" Hydraulic chuck, Max machining Dia. 11.41", Max length 21.26", Max bar capacity 2.59", X Travel 9.25", Z Travel 21.26", A2-6 Spindle nose, 3.05" Spindle bore, Spindle speeds 5,000 rpm, VDI Type 12 station turret, 60° Slant bed, Tool shank size 1.5" round & 1" square, Rapid traverse rates X/Y 984/1,181 ipm, GE Fanuc Series 21i-TB Control, Electric foot pedal, Coolant system, Chip bin, 30hp 22kw 220v 3ph 60hz 100 amp, Overall Dim. 106"L x 57"W x 75"H, Est. Wt. 9,810 lbs. 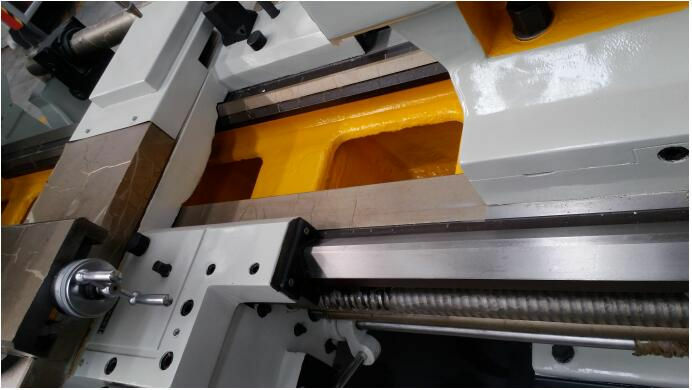 Model Puma 8S, S# PM8S1060, 2 Axis machine, Combination type, Mitsubishi CNC control, Rated 17" Swing over bed (19.7" max), Rated 9.1" Swing over carriage (12.2" max), Max turning Dia. 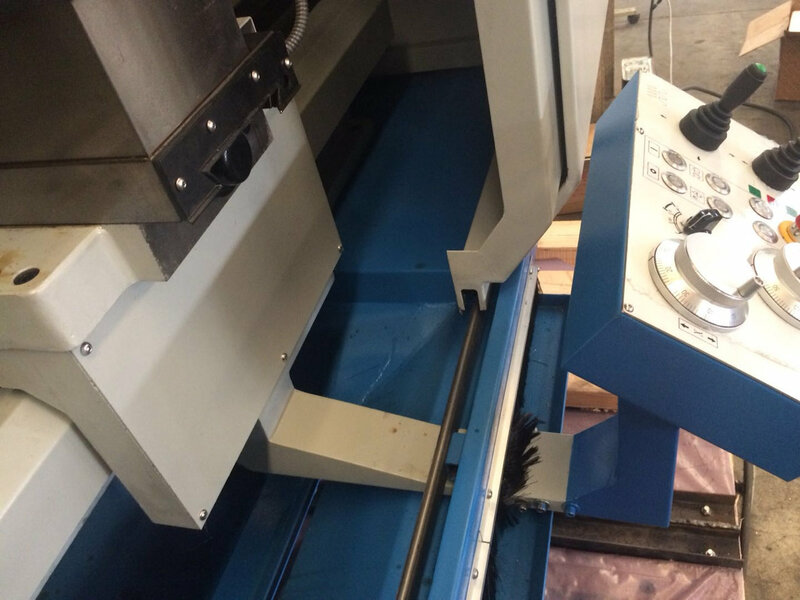 14.1", Max turning length 14.6", 7.1" Max cutting diameter, 14" Max cutting length, 1.5"" Thru hole, Spindle speeds from 50 to 5,000 rpm, 12 Station turret, #4MT Tailstock, Programmable tailstock, Tool setter, Chip conveyor, Coolant system, Royal mist filter, Auto lube system, 20hp 220v 3ph, Overall Dim. 11' 5"L x 5' 4"W x 7' 8"H (on wood skid), Est. Wt. 9,500 lbs. 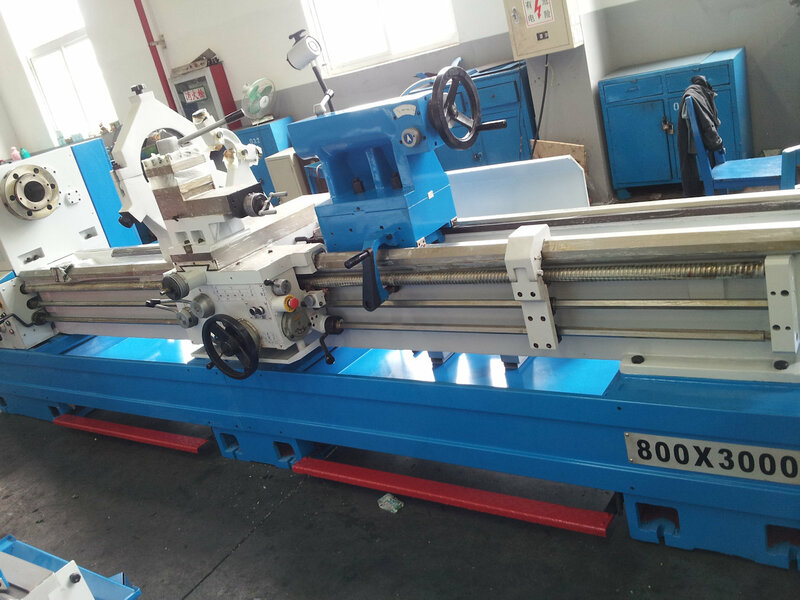 Dynapath CNC Lathe - 15" x 36"
Grizzly G1550 Lathe - 8" x 18"
Hardinge HLV-H Lathe 11" x 18"
Model HLV-H, S# HLV-H-1870, 11" Swing, 9" Over carriage, 6" Over cross slide, 18" Between centers, Newall DPG DRO, Variable speed spindle from 125 to 3,000 rpm, 1.25" Thru hole, 27 Threading ranges 11 to 108, Power feed on carriage, Collet closer (not pictured), Storage in base w/ 2 collet racks, Tailstock spindle taper No. 2, Built in coolant, 1/10hp Gusher pump, 1.5hp 220v 3ph 60 cyc, 110v Control, Overall Dim. 5' 5"L x 2' 4"W x 4' 9"H, Est. Wt. 1,800 lbs. 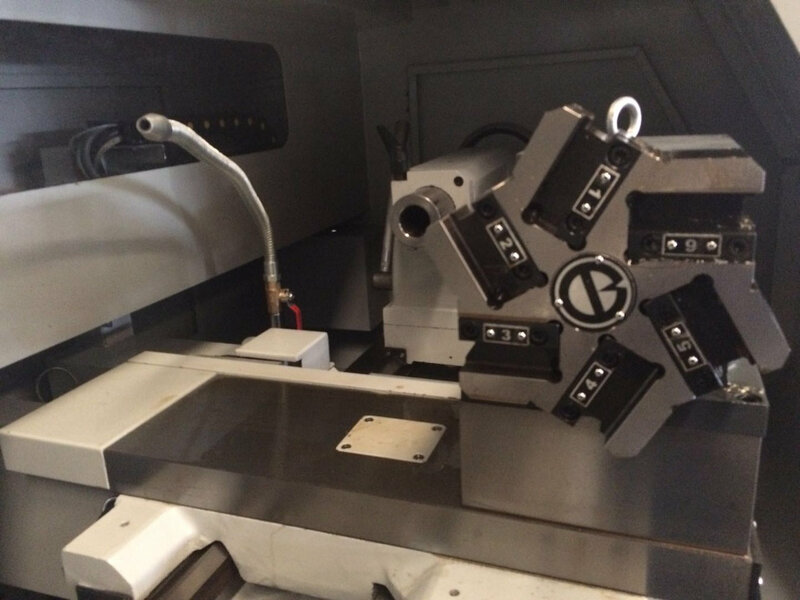 Model SB-4-GN, S# SB-909, Spindle drive 7.5" Dia., 12.5" 3 Jaw chuck, Has (2) 8 way turret tool holders, Tooling: Est. (10) Holders - Est. 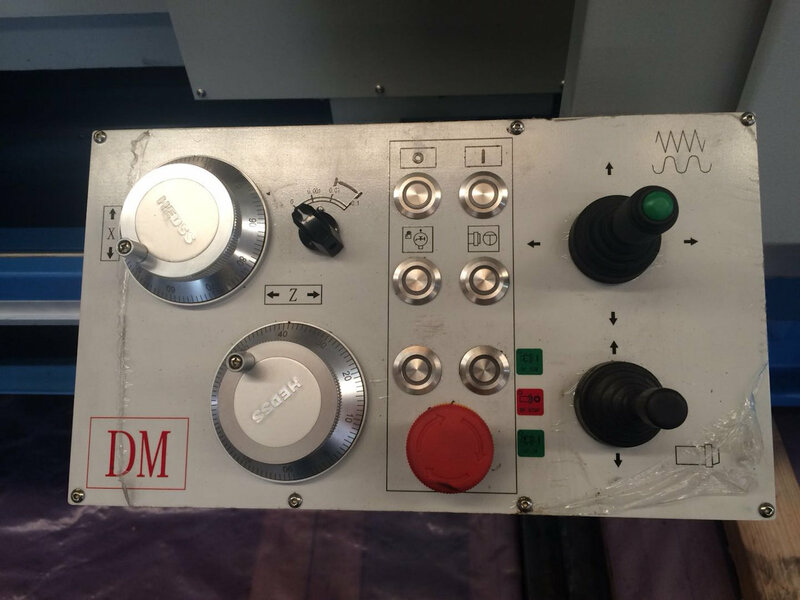 (7) 16C Collets, Siemens CNC programmable control, Built in coolant system, Variable speed Turbo Conveyor Model 6275-8008, S# 309099, Slide shut safety door with port window, Machine 18.8kw 460v 3ph 18.8kw 41fla 60hz spindle drive 12.5, 115v Control, Wiring Dia. SBA-8220-GN, N/C GN 6TC, 200,000 amps, Overall Dim. 13'L x 6' 2"W x 7' 6"H, Est. Wt. 7,500 lbs. 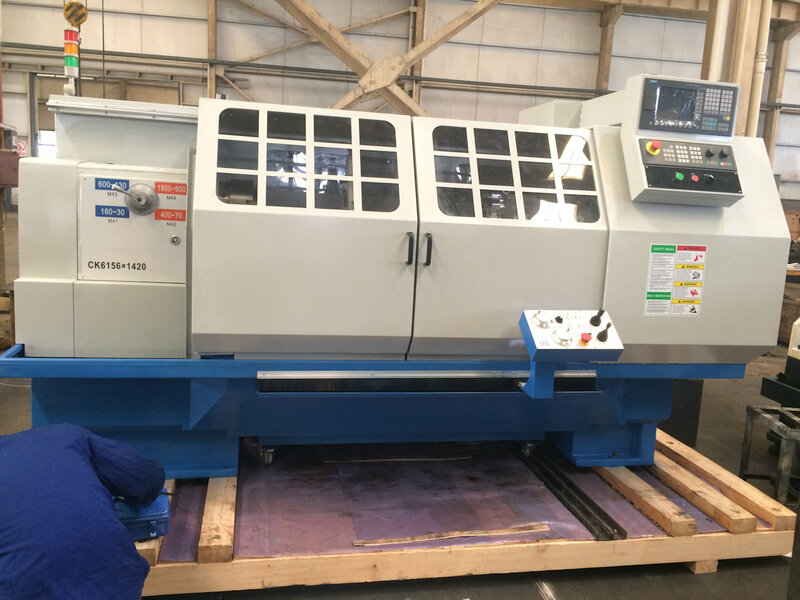 Hoston CK6156/1000 CNC Lathe - 22" x 40" - "New"
LeBlond Regal 15" x 54"
LeBlond Regal 19" x 80"
LeBlond Regal 15" x 6' 10"
LeBlond Regal 18" x 55"
Lodge & Shipley 20" x 48"
Model 20", S# 33843, 24" Swing max, 48" Between centers, 15" 4 Jaw chuck w/ reversible jaws, 24 Spindle speeds from 9 to 500 rpm, 2.5" Thru hole, 55 Thread/feed ranges from .0025" to 160", Thread dial on carriage, Taper attachment, No. 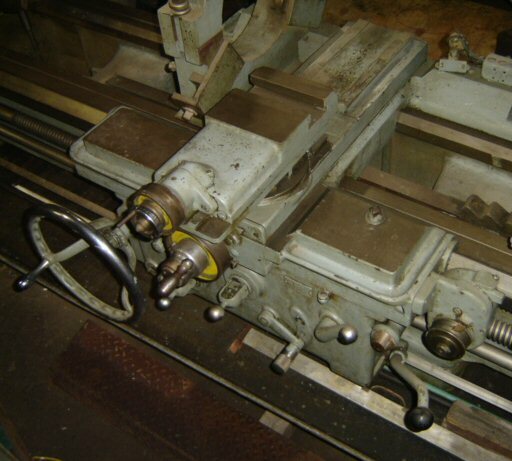 5 morse taper on tailstock, Oil cup lube system, Built in chip catch pan, 10hp 220/440v 3ph, Overall Dim. 11' 7"L x 5' 2"W x 5' 4"H, Est. Wt. 11,500 lbs. 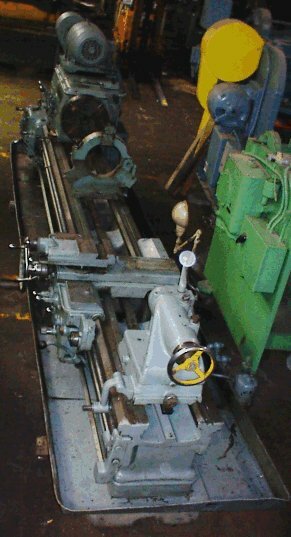 Lodge & Shipley Power Turn Lathe 20.5" x 54"
Model V13, S# D1H 8208004, 13" Swing, 36" Between centers, Sargon X/Y DRO, 8 Spindle speeds from 50 to 2,000 rpm, 6.25" 3 Jaw chuck, 1.4" Thru hole, Inch/mm threading, Thread dial on carriage, Compound tool holder, JFK quick lock collet closer, Quick change tool post, Safety shield over chuck, Work light, Follow rest, Slide out chip catch pan, 2.2kw 220v 3ph 60hz 8.5amp, Overall Dim. 6'L x 32"W x 6'H (on 4"H wood blocks), Est. Wt. 1,400 lbs. 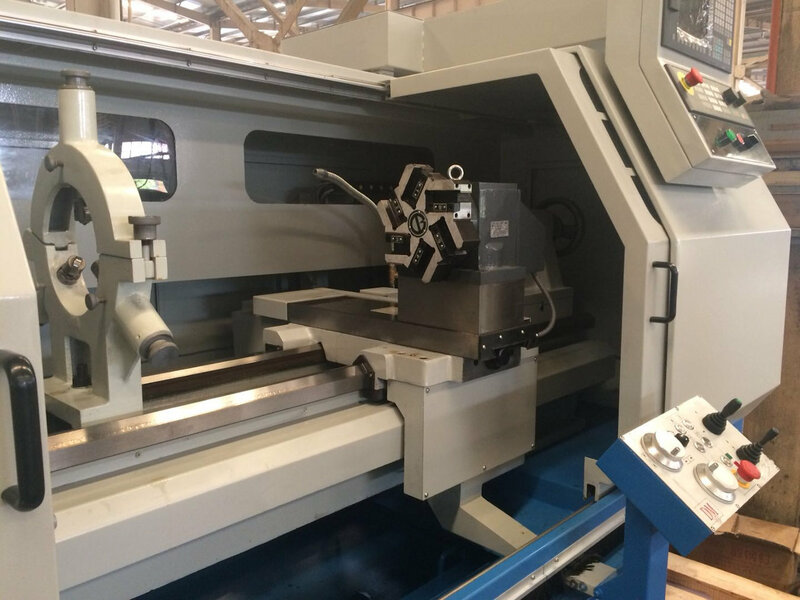 Model ST-20-ATC, S# 93956, 10.5 " Swing, 20.87" Max turn length, 37" Between centers, Factory refurbished computer w/ reinstalled parameters, Mazatrol T32-3 CNC control, 8" 3 Jaw chuck, 16 Tool changer, Travel: X/Z 10.6"/21", 2" Bar capacity, Variable spindle speed up to 3,600 rpm, A2-6 Spindle nose, Milling speed up to 2,500 rpm, 2.4" Spindle bore, Tail stock, C Axis included, Loaded with tooling (horiz. & vert. 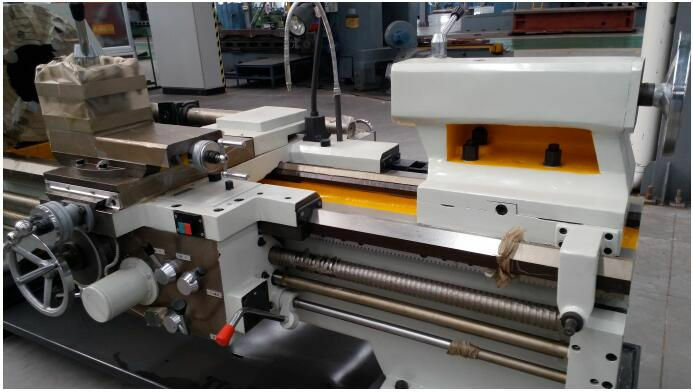 Milling heads), Chip conveyor, Coolant system, Spindle motor 20hp 460v 3ph, Milling motor 5hp, Overall Dim. 114"L x 68"W x 68"H, Floor space 13' 4"L x 5' 8"W x 7' 6"H, Est. Wt. 10,800 lbs. 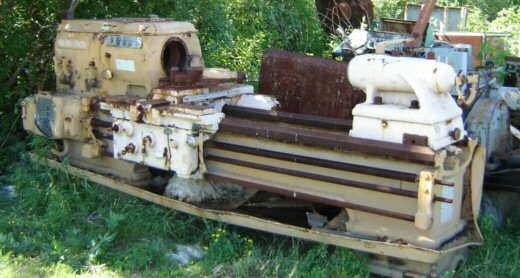 Monarch 10"EE 12.5" x 20"
Monarch 16"CW 18.5" x 54"
Monarch Parts Lathe 30.5" x 48"
Pratt & Whitney 16" x 30"
Model 16 x 30, S# 1508-951, 16" Swing (18" max swing), 30" Between centers, 9" 3 Jaw chuck, D1-6 Camlock mount, 18 Spindle speeds from 21 to 1,500 rpm, 2.25" Thru hole, 60 Threading ranges from 1 to 60, Built in thread dial on carriage, Adjustable carriage stops on cross rail, Built in coolant, 1/4hp Coolant pump, 5hp 220/440v 3ph (wired on 440v), Overall Dim. 8'L x 4' 10"W x 4' 9"H, Est. Wt. 4,200 lbs. 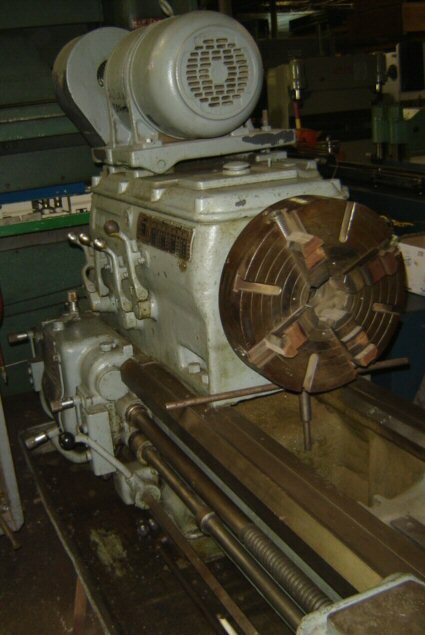 Rockwell Tool Room Lathe 11" x 24"
Model No. 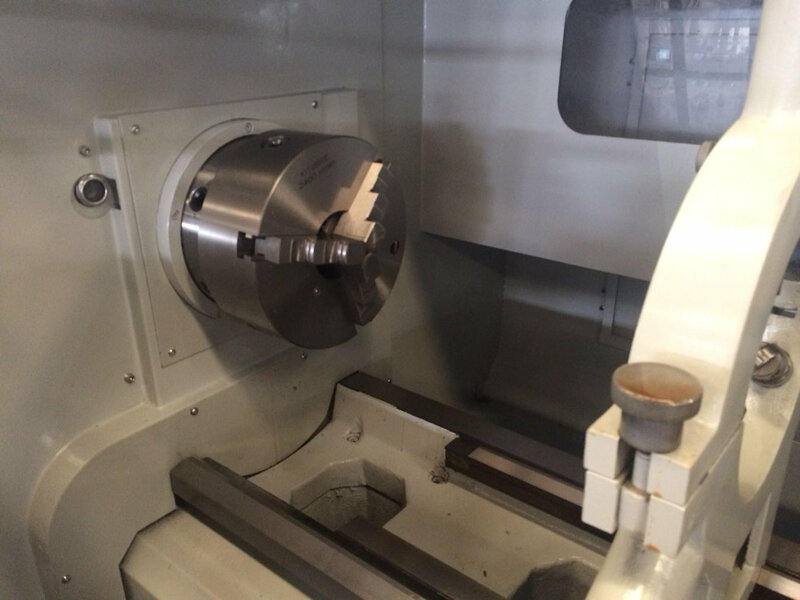 25-117 Special, S#151-6522, 11" Swing, 6" Over cross slide, 24" Between centers, 6" 3 Jaw buck chuck, LOO Mount, Variable speed spindle from 45 to 1,550 rpm, Taper attachment, Collet closer w/collets, 48 Threading ranges from 4 to 224, Thread dial on carriage, Follow rest, Storage in base, 1hp 115/230v 1ph, Overall Dim 5' 6"L x 2' 1"W x 5' 2"H, Est. Wt. 1,250 lbs. 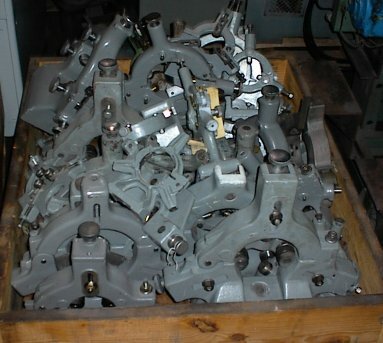 Model "A", S# S8485, 9" Swing, 20" Between centers, 5" 3 Jaw chuck, 12 Spindle speeds from 39 to 1,430 rpm, 3/4" Thru hole, 27 Threading ranges from 8 to 76, Collet draw bar with collets, 3 way built in turret on carriage, Jacobs drill chuck in tail stock, Full length chip catch pan, 2hp 220v 3ph, Overall Dim. 4' 9"L x 2' 6"W x 4' 1"H, Est. Wt. 2,000 lbs. Catalog No. CL187RB, S# 23173R, 10" Swing, 32" Between centers, 4.5' Bed, 6" 3 Jaw chuck, Camlock chuck mount, 1.5" Thru hole, Newall DP7 X/Y DRO model 7L211000, 3 Way step pulley belt drive, 70 Threading ranges from 4 to 480, Taper attachment, Thread dial on carriage, Storage cabinet in base, Built in coolant, flame hardened bed ways, Full length chip catch tray, 1/10hp coolant pump, 2hp 208-220/440v 3ph, Cleaned & painted, Overall dim. 5' 6"L x 27"W x 5' 7"H, Est. Wt. 1,200 lbs. S# 02892R, 10" Swing, 36" Between centers, 12 Spindle speeds from 55 to 1,400 rpm, Fwd/rev on spindle, 6" 3 Jaw chuck, 5C Spindle nose with draw tube, 1.5" Thru hole, Taper attachment, 48 Threading ranges, Thread dial on carriage, Quick change tool post, Built in chip catch pan, Storage in base w/ Misc. 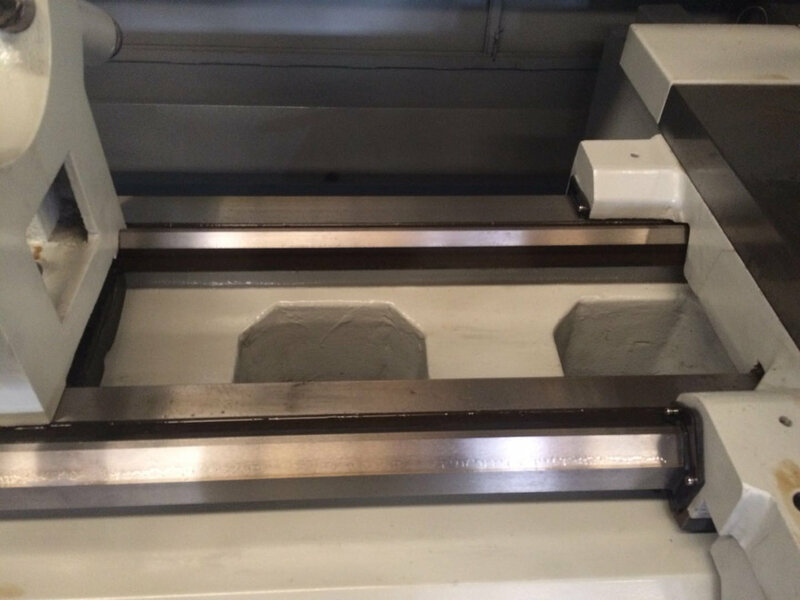 tooling & collets, Flame hardened bed ways, 1hp 460v 3ph 60hz, Cleaned & painted, Overall Dim. 5' 6"L x 31"W x 47"H, Est. Wt. 1,200 lbs. 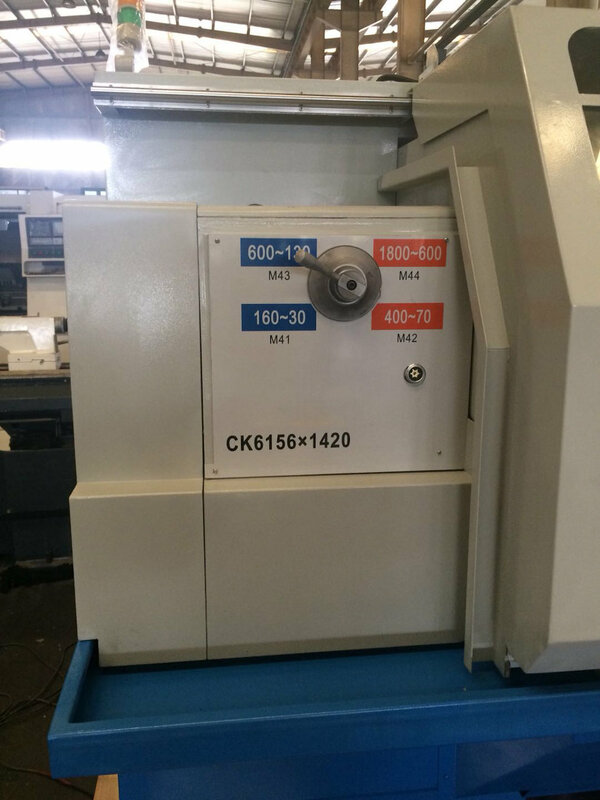 Catalog # CLK-145B, S# 11458TKX14, 13" Swing, 30" Between centers, 1.5" Thru hole, 3 Jaw chuck, Spindle speeds via 4 way step pulley flat belt drive system, Quick change lift lever in base cabinet, 48 Threading ranges from 4 to 224, Thread dial on carriage, Flame hardened bed ways, Oil cup lube, Built in chip catch pan, Tailstock morse taper No. 3, Overall Dim. 5' 8"L x 2' 6"W x 5'H, Est. Wt. 2,100 lbs. Cat. No. 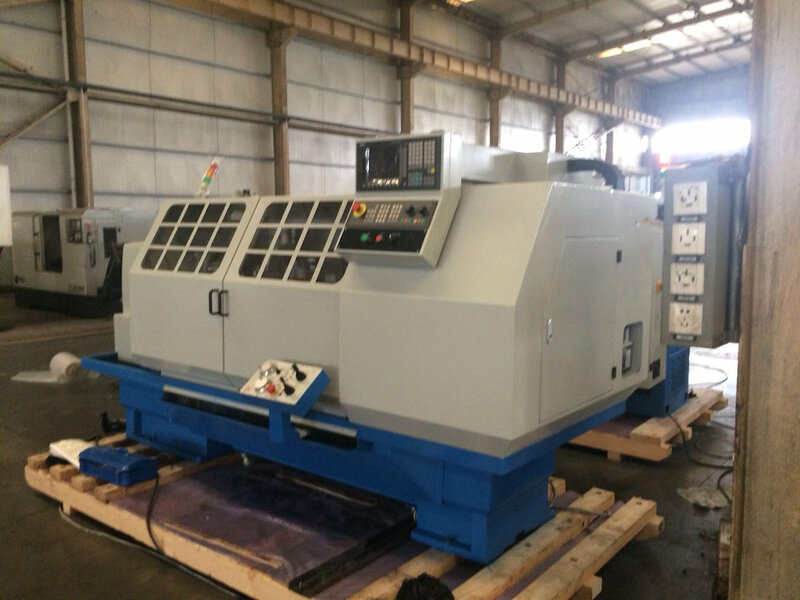 B117-C, S# 167372, 16" Swing, 36" Between centers, 7.5" 3 Jaw chuck, 1.5" Thru hole, Variable speed spindle, 48 Threading ranges from 4 to 224, Taper attachment, Chip catch pan, Cleaned & painted, Drive motor updated 2hp 460v 3ph 60hz, Overall Dim. 6' 11"'L x 37"W x 4' 4"H, Est. Wt. 1,800 lbs. Standard Modern 1334 13" x 34"
Standard Modern 1530 15" x 30"
Model 1530, S# 7239, Date Mfg. 1973, 15" Swing, 30" Between centers, 10" 3 Jaw Buck chuck, D1-6 Mount, 16 Spindle speeds from 30 to 1,800 rpm, 2 1/8" Thru hole, Taper attachment, Full length built in chip catch pan, Built in coolant, Work light, 5hp 230/460v 3ph, Overall Dim. 6' 6"L x 40"W x 4' 7"H, Est. Wt. 2,200 lbs. Standard Modern 2630 26" x 30"
Model 2630, Catalog No. 52315, S# 11468, Date Mfg. 04/92, 26" Swing, 30" Between centers, 18 Spindle speeds from 27 to 1,600 rpm, 10" 3 Jaw chuck, 3" Thru hole, Inch/mm threading, Micrometer adjustable stop on bed way, 5hp 230/460v 3ph, Cleaned & painted, Overall Dim. 80"L x 44"W x 73"H, Est. Wt. 3,500 lbs. Standard Modern 1660 16" x 60"
Standard Modern 2060 20" x 60"
Standard Modern 2080 20" x 80"
Model 2080, Catalog No. 52209, S# 10440, Date Mfg. 1982, 20" Swing, 80" Between centers, 36 Spindle speeds from 23 to1,500 rpm, 3" Thru hole, 12" 3 Jaw chuck, Inch/Metric threading, Taper attachment, Inch/Metric dials, Engage lever on carriage, Slide stop dogs on lower rail, Built in chip catch pan, 20hp 230/460v 3ph, Cleaned & painted, Overall Dim. 11' 4"L x 3' 10"W x 6' 7"H, Est. Wt. 5,500 lbs. 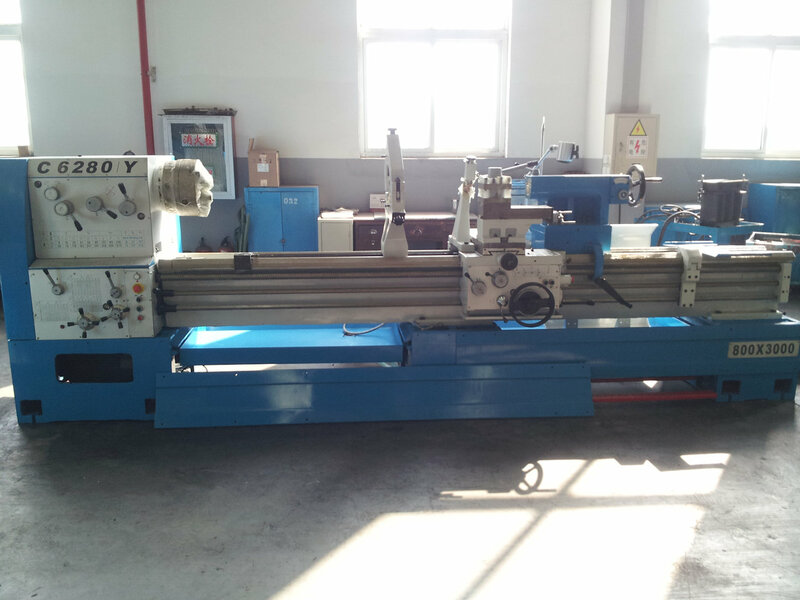 Supermax YCM-TC-2 CNC Lathe 18" x 20"
Model YCM-TC-2, S# 908093, Date Mfg. 1989, 18" Swing, 20" Between centers, 8 Station tool holder, 2" thru hole, Fanuc CNC controls, Slide open front safety door w/ port window, Slide out coolant tank on wheels, Comes with tooling and secondary head with a 5C collet setup, 1/4hp coolant pump, 1hp Hydraulic pump, Overall Dim. 8'L x 5'W x 6' 3"H, Est. Wt. 4,500 lbs.